For LGBTQ+ travellers, what's legal in one place can be punishable by prison, or worse, in the next. 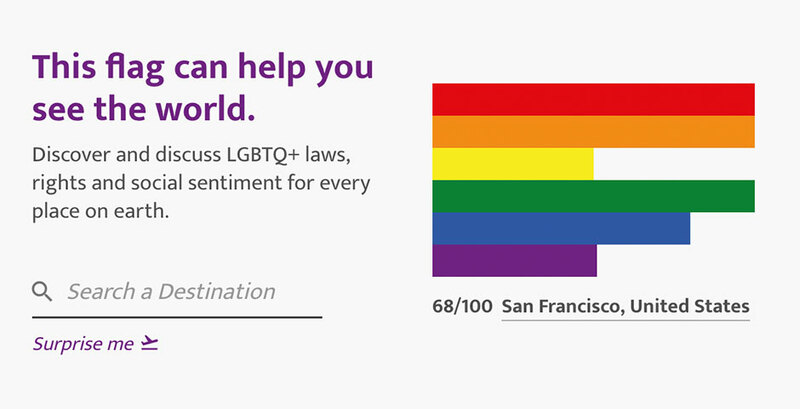 That's why we created Destination Pride—a data-driven search platform that reimagines the Pride flag as a bar graph of the world's LGBTQ+ laws, rights, and social sentiment. Which country is it again that's hostile to gay people?" It's a brutal question and not really fair when you unpack it. But it's a question LGBTQ+ people ask travel agents every day. What we observed is that even the good ones were struggling to answer it. This project is an attempt to develop a global measurement system for acceptance—to provide utility, while shining a light on inequalities. Any time you're lucky enough to put your finger on something that's hidden in plain sight, it's rewarding. Of course LGBTQ+ laws are different in different countries. And yet somehow the topic seemed under-discussed. Key learning: When we started seeing well-known gay-friendly destinations score lower than we'd assumed. For example, we all want San Francisco and Toronto to score off the charts. Because it confirms a progress narrative. Truth is both these places have laws on the books that marginalize the LGBTQ+ community. We'd hoped that the world would embrace the platform, see its value, and then help us make it better. And that's been the case. The work began with PFLAG. Now we're talking to global travel brands to see how they can use Destination Pride to help their customers make better decisions. The response so far among the platform's users—the LGBTQ+ community—has been good. The moment we turned the Pride flag into a bar graph. That was a big moment. We had a bunch of the nuts and bolts of the how and why worked out—but needed a way to bring more beauty and stopping power. Plotting the data against this important symbol of LGBTQ+ rights unlocked a lot of meaning and emotion. One of the big promises of data and technology is that they'll help us get better at recognizing the individual. Our hope is that the closer we get to the people we're serving, the more responsive we'll become to what they actually want and need.